No, I did not forget that it is GG Monday (though no episode tonight). After my layover in Vegas, a cold, and one last final due, I am finally getting around to posting. Today's post is a bit scattered but enjoy! 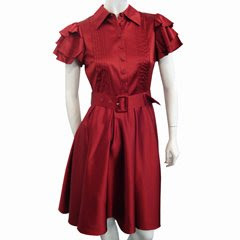 I think we all loved this red Catherine Malandrino dress that Blair wore. It is on sale in sizes 4, 6, and 8. I need this pink jacket! the winter white tights blair wears in the upcoming episode must be added to my closet, like, pronto, asap!! We have never seen that many pair of brightly colored tights in one photo! The pink ones are too wacky! We loved reading your Christmas traditions - thanks for posting them! Hope you got home safely! I love the pic from the upcoming GG episode. I need that pink jacket! any idea where it's from? I adore the Catherine Maladrino dress. And methinks that houndstooth coat Blair is wearing in the other photo is a Milly from the fall season? Looks just like the one I've been stalking. no that is a dress I would LOVE to own! I love the dress and the black/white jacket. :-) So cute! P.S. I need your L.A. address so I can send you your Christmas card. Otherwise it will go to D.C. and you won't get it until you go back. :-( That would be sad! That dress is gorgeous!! I love seeing all their headbands and tights.